The U.S. Post Office and Courthouse is one of the most architecturally important and distinguished buildings of the early 20th century remaining in downtown Atlanta. Built in the Second Renaissance Revival style, the Old Post Office was first occupied in 1911 after more than three years of construction. James Knox Taylor, Supervising Architect of the Treasury Department at the time, designed the building. The Old Post Office is an imposing building, covering one block in the center of downtown. The five-story, U-shaped building has a granite exterior on the street facades and buff-colored brick surfacing in the court area. The ground story is rusticated while the upper wall surfaces are smooth, providing a background for a variety of ornate openings. Surmounting the building is a heavy cornice making the low roof invisible from the street. The basic interior floor plan has not changed drastically, although some details have been either altered or eliminated. The halls of the first floor or main post area consist of series of arches resting on flat marble pilasters. Wainscoting and window and door framing are marble while upper wall surfaces are plaster. Elevators are located near the stairwells, although the original grillwork has disappeared. The United States Court of Appeals is located on the third floor. The large, rectangular courtroom is covered with elaborately carved oak paneling, repeating many of the motifs of the exterior. In 1931, major postal services were moved to a newer building. 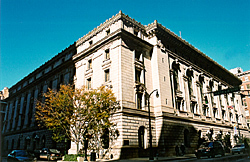 The U.S. Post Office and Courthouse is located at 76 Forsyth St. in downtown Atlanta. It is now the Federal Court of Appeals and is not open to the public.